i started getting messages from the hudson union society a year or two ago. i think they have something to do with my association with the overseas studies program at college (they were originally the oxonian society), but who can say? every so often i'm invited to interviews, lectures, and so on. 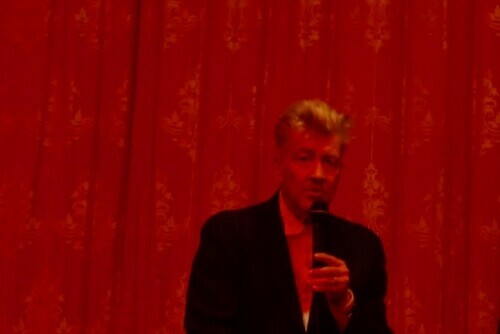 two weeks ago, they dropped me a line about "a rare and surreal evening with the legendary david lynch." that mysterious sonic boom you heard at the beginning of the month? that was me, on it like dale cooper on pie. dress was "at least business casual." i wanted very much to accessorize with my log; joe assured me that that would be deeply uncool. i settled for what in my head was a tip of the hat to mulholland dr.
we learned we were going to the russian tea room after we bought the tickets. it's a regular venue for the society, but i think it was (cough) rather uniquely suited to the speaker this time around. we were told to take an elevator to the third floor; it stopped on the second and opened into a room full of trees hung with ostrich-sized easter eggs. "isn't that him?" "yes, but he's not ready yet." we continued up to a mirrored room and had blisteringly expensive glasses of wine. 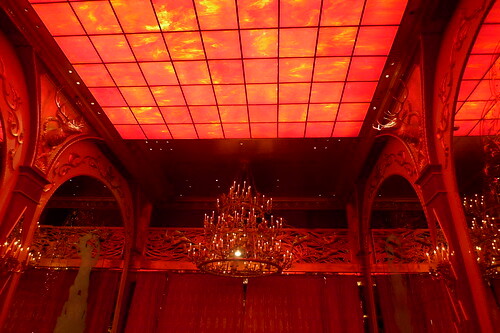 it was extremely difficult to tell whether the creatures on the chandeliers were bears or apes. lynch spoke for an hour or so, gamely retelling the stories of how george lucas shipped him up to skywalker ranch to try to talk him into directing return of the jedi and of how he had a chocolate shake at bob's big boy every day for seven years (and saw the man who inspired him to create frank booth there). he was most animated as he spoke of transcendental meditation, and had a great plosive poom! to describe the moment of transcendence ("beautiful!"). he exclaims single words quite a bit. he is, as advertised, not fond of discussing what things mean. "if you just saw the movie, you saw it. that was what it was, right there." i didn't think i could be one of the audience members who asked him if he considered his filmography representative of "the ocean of creativity," so i asked him why he climbed into the dumpster behind bob's one day. "because i had a feeling the shakes weren't really made of ice cream," he said. Which might, at the end of the day, be the only reason anyone ought ever to climb into a dumpster. To see if the ice cream was real. i certainly should've left my retainer to its fate, LPC. Was the retainer, at least, real? An educational, if not savory, 'everyone should do it once' experience! I'd recommend it for any parent who packs their child's lunch (hint: they throw away anything and everything even vaguely healthy:whole apples, bananas, entire sandwiches still in their baggies, unopened yogurt...anyone down and out and worrying about their next meal should hit the local elementary school dumpster early in the afternoon). On the plus side: I found the retainers both times, and at 400+ bucks apiece I was actually pretty proud of myself.